Last week I mentioned that sometimes I am at a loss for something to post about on MBA Mondays. Andrew Parker, who got his MBA at Union Square Ventures (largely self taught) from 2006 to 2010, suggested in the comments that I post about the differences between Enterprise Value and Market Value. It was a good suggestion and so here goes. The Equity Market Value (which I will refer to as Market Value for the rest of this post) is the total number of shares outstanding times the current market price for a share of stock. To make this post simple, we will focus only on public companies with one class of stock. The Market Value is the price you are paying for the entire company when you buy a stock. Let’s use Open Table, a recent public company as our real world example in this post. Open Table (ticker OPEN) closed on Friday at $48.19 and has a “market value” of $1.1bn according to this page on Tracked.com. According to Google Finance, Open Table has 22.77 million shares outstanding. So to check the market value calculation on Tracked.com, let’s multiply the market price of $48.19 by the shares outstanding of 22.75 million. My desktop calculator tells me that is $1.096 billion. So if you purchase Open Table stock today, you are effectively paying $1.1bn for the company. But Open Table has $70 million of cash and has $11.6 million of short term debt outstanding. So if you paid $1.1bn for the company (as would be the case if your company purchased Open Table), then you would be getting $70 million of cash and a debt obligation of $11.6 million. So the Enterprise Value of Open Table, meaning the value of the business without any cash or debt, is a bit less than $1.1bn. To get the Enterprise Value, you calculate the Market Value and then subtract cash and add debt. When we do that, we find that Open Table currently has an Enterprise Value of $1.038bn. Not much difference in percentage, but almost $60mm in difference in dollars. 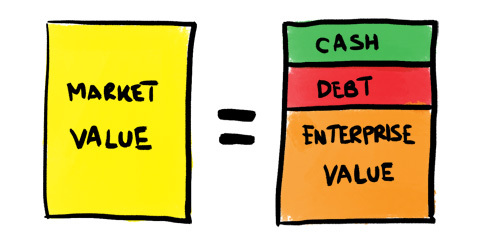 There are some companies that have a lot of cash or a lot of debt relative to their Market Values and in those cases it is really important to do this calculation to get to Enterprise Value. We do a lot of valuation analysis on our portfolio companies, particularly the ones with a lot of revenues and profits. We do them mostly for our accountants as part of something called FAS 157 or “mark to market accounting”. I am not a fan of FAS 157 and I’ve blogged about it here before. But regardless of whether or not I think “mark to market” is the right way to value a venture portfolio (I do not), it is the current practice and we need to do it. When we do valuations, we often use public market comps to get “market revenue and profit multiples” and then we apply them to our portfolio companies. When you do this work, it is critical to use the Enterprise Values to get the multiples. Then when you apply the multiples to the target company, again you need to get an Enterprise Value and then work back to get Market Values. If you use Market Values to calculate multiples, you may end up with some really screwy numbers for businesses with a lot of cash or a lot of debt. So use Enterprise Values when you are doing valuations and calculating multiples. Fred, I think it’s essential to point out to your readers when to use market value and when to use enterprise value in calculations, hence avoiding the “screwy numbers”. The knack is to figure out which capital base contributed (or has a claim) on the value. For example, EBIT, EBITDA and Free Cash Flow are all ‘enterprise value’ figures. All of the capital base (ie debt + equity) contributed to them and therefore have a claim. Numbers which come after the interest charge mean that debt has already taken its share. So you use market value for earnings and dividends. eg Net Profit / MV (the inverse of the PE ratio) or Total Dividends / MV (the yield). This article was originally written by Fred Wilson on August 9, 2010 here.